Since the title of my blog is Conversations With Horses, today I thought I’d talk to a couple of horses. Fictional ones, of course, featured in my book Forewarning. 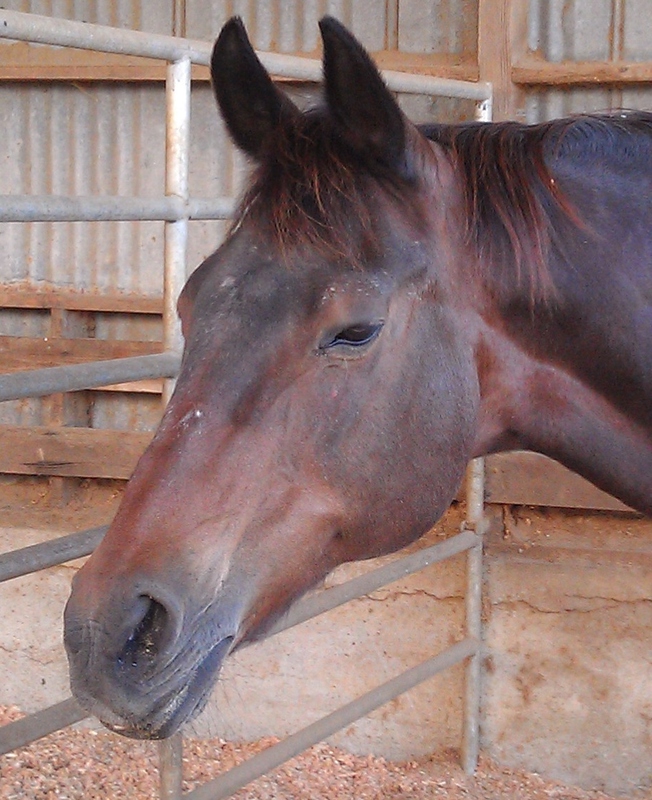 They are based on ones I’ve known and hopefully will give you an insight into horses’ minds. So Paris tell us about yourself. “My real name is Harrbit’s Parisienne. I’m a beautiful dappled grey Anglo-Arab. That means I’m half Thoroughbred and half Arabian—horse royalty. 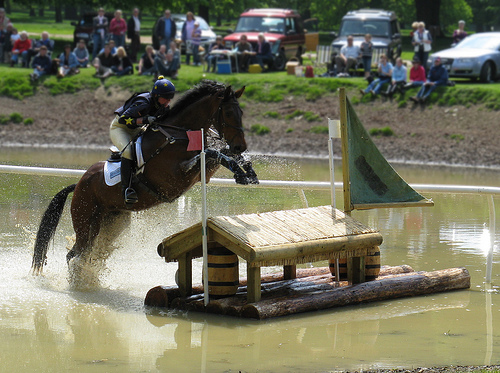 I was bred for Three Day Eventing and I loved to jump, particularly in the show ring where people noticed and admired me. Something bad happened to me before I came to live with Kasey; I don’t like to talk about that. Kasey fixed me up but I don’t get to jump any more. I miss all the attention and fussing and special things associated with showing. 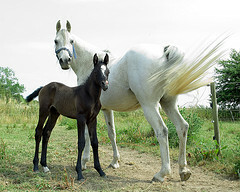 I alternate between having foals–oh how I love my babies—and being a trail horse. Dancer and I make really nice foals and Kasey lets me keep them for six or seven months and then waits until the following year to breed me again. 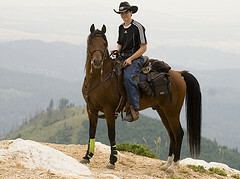 After my babies are weaned, I become her trail horse and ride the mountains with her. I love exploring new trails. I get enthralled and walk so fast other horses have a hard time keeping up. But I don’t like it when things change on familiar trails. I have to look very carefully to be sure that big branch or rock slide isn’t something to run from. Once in a while, I’ll play games with Kasey and pretend to be afraid when I’m really not. She usually figures it really quickly and stops my fun. That’s okay, I love her and always run to gate when she comes. 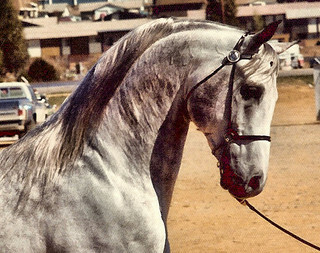 Now I’m going to skip to the most important horse on ranch—Dancer, Kasey’s regal stallion. 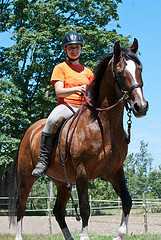 “My name is Willow’s Sundancer and I am a chestnut Trakehner stallion. My breed developed in East Prussia in the 1700’s and were used as cavalry horses. 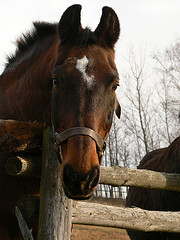 It is the oldest of the European warmbloods. Like Paris, I was bred for Eventing too, but I also quite enjoy dressage. Kasey bought me as a yearling and trained me. We competed for a few years and I was very successful. I had lots of admirers, which is why I am so popular as a breeding stallion. I have offspring all over the world,. Now I have an even more important job—protecting the ranch. As a stallion, I must make sure my herd, which includes Kasey, is safe from danger. While I may romp and play, I never relax my vigil. I’m very aware of everything that goes on and ready to take action if necessary. 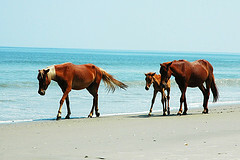 Of course, I’m also quite interested in the ladies and wish I could live with the mare herd. Unfortunately, Kasey doesn’t agree. I definitely could do without the pesty geldings. They can be so ridiculous at times. If you have horses, what are they like? What kind of personality does your animal have? International level dressage is wonderful to watch and attracts large audiences who delight in the dancing and skipping horses doing intricate figures. But as enjoyable as it is to observe, it’s even more fun to do. Of course at the high levels, the riders are full-time professionals and the horses worth millions of dollars. That doesn’t stop thousands of average horses and riders from joining the fun. 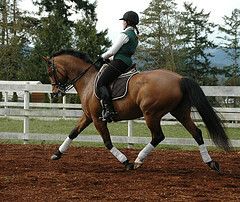 Dressage is the French word for training and refers to the basic training all horses should have. It’s not limited to English riding; the principles apply to Western too. 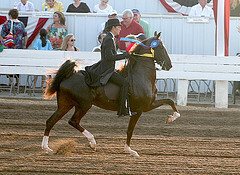 In fact, you often see demonstrations of Western dressage. The aim is to develop a relaxed, attentive, supple horse that responds effortlessly. One of the nice things about dressage is it is an absorbing activity that you can do alone without being part of a team—although a trainer is vitally important. You can compete if you want, but the training pyramid provides levels to achieve and can give you a sense of accomplishment without having to show. It takes years to move up the levels, so there is always more to learn and accomplish. This feature is probably why dressage has become so popular with educated, professional women. They like something that requires concentration, dedication and measurable goals. You can do dressage with any horse but one with the correct conformation and native ability will make it easier to advance up the levels. You want one with a good mind, a willing disposition and the physical ability to do what you ask. A horse specifically bred for dressage (usually a warmblood) can be pricey, but you can also find ones with a lot of talent in other breeds. 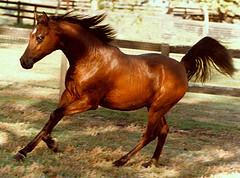 Off-the-track Thoroughbreds often are good choices because of their work ethic and athleticism. 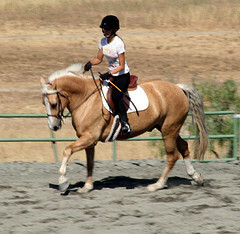 My OTTB mare Glory was quite talented and trained to Third Level. Here is a video of a Training level, Test 1 ride. Compare it to this Second level test. In addition to the basic tests, you can also compete in a Freestyle at each level. This is a performance set to music where you demonstrate all the required moves for that level, but with your own choreography. Watching horses do the same moves over and over at the lower levels is only interesting to other dressage riders, but audiences of all kinds love the Freestyles. Here is a video of an Amateur Adult Rider doing a delightful freestyle. Today I’m a guest on “Stilettos at High Noon,” a blog devoted to Western romance fiction, and I’m talking about horses in the old West. Rather than have two blogs on the same day, I’d appreciate it if you’d stop by Stilettos and take a look. And hopefully comment. 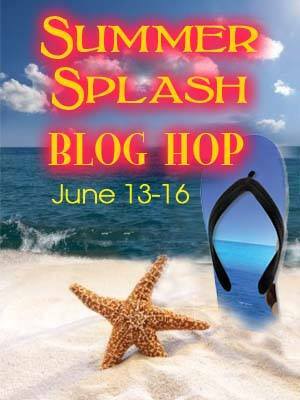 In a little over two weeks, June 13-16, I’ll be taking part in the Summer Splash Blog Hop. 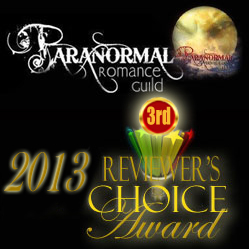 Stay tuned for details on how you can win books and lots of other prizes. Sorry for being a little late today. The computer gods were being difficult. Last time I talked about how horses communicate with sounds. While humans are naturally most focused on vocalizations, the horse’s most important form of communication is by body language. The variety and complexity is actually quite astounding. If you see a horse with its ears back and pinned to its head, eyes slitted, nose tight, and head snaked forward in an aggressive manner, I hope you would realize that the animal is upset or angry about something. And that you would have enough sense to stay away. On the other hand, a horse with its ears forward, eyes open, nose relaxed, and head slightly extended is interested in something and possibly looking for a treat. That’s a horse you can approach (with the owner’s permission). Between these two extremes are a wealth of expressions that indicate what is going on with a horse. And this is just looking at the head. The ears are like miniature radar cones and they tell you where the horse is focused. Ears rigidly forward with the head high, eyes wide and nostrils flared says he’s on high alert and looking at something exciting or scary and debating about departing the scene. Since horses are prey animals, their first response to something frightening is to flee. That plastic bag may be a horse-eating monster! A slightly modified version of this, with the head down and a curious expression, indicates something interesting to explore. Again, as prey animals, it’s important for them to investigate their environment to determine if something is a threat, so they have a strong sense of curiosity. And an even stronger desire to play. My Portia was initially scared of the pink un icorn piñata hanging from a tree near the pasture and high-tailed it back to the barn. When a crowd of kids gathered around it and began playing with it, she couldn’t contain her curiosity and crept back up to the fence. Each time someone whacked at the toy and sent it swinging, she’d run away, then stop and turn to watch. In a few minutes, she was back at the fence again. I think she was quite disappointed when it finally broke. Ears that are swiveled backwards are quite different from angry, pinned ones. These mean the horse is focused on something behind him, hopefully the rider. 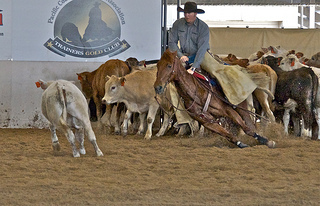 You see this quite often in training sessions and in the show ring. The horse is paying close attention to the rider’s commands. You’ll also see one ear turned back and the other forward or sideways. 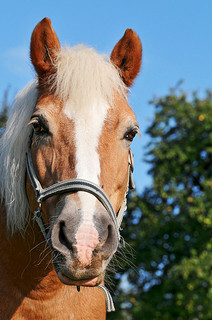 This indicates a divided attention, with something that the horse needs to keep an eye and ear on. Sometimes you’ll see the ears flopped sideways, with the head down and eyes half closed, indicating a totally relaxed, unconcerned attitude. This is great when lazing around in the pasture. However, on the trail a spaced-out horse could be suddenly startled and react in a way that may unseat its rider. Personally I prefer a horse that’s paying some attention to its surroundings. Learning to read horse body language is a skill that takes time to develop. Also, not all horses are alike, so you need to be aware of the individual. But if you’re going to be around them (or write about them), it’s a vital knack to develop. 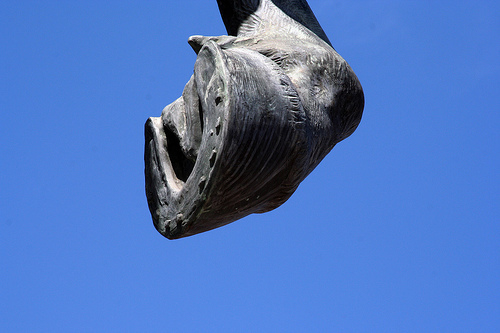 This post focused on the head. Next time I’ll talk more about the rest of the body. May is coming soon and with it the Kentucky Derby. 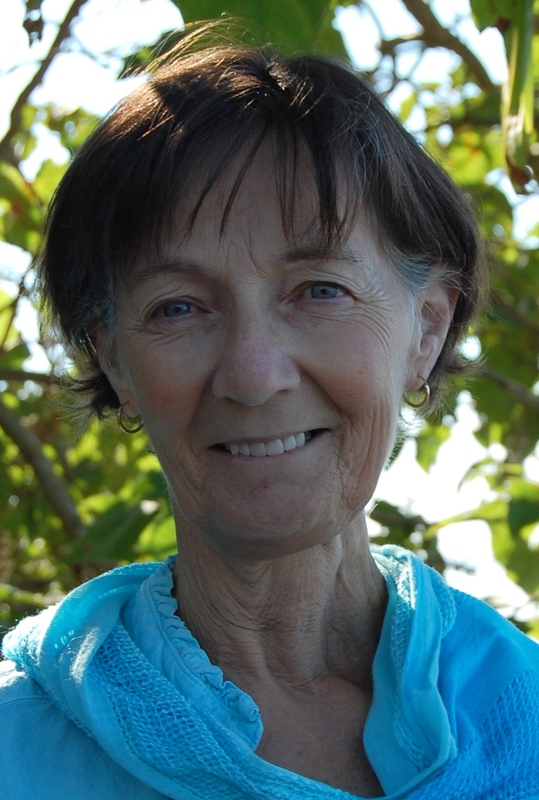 Today author Kathryn Jane, a race horse trainer, tells us some interesting facts about the Derby and its traditions. With the approach of the first Saturday in May, better known in my circles as Kentucky Derby day, I thought I’d share six interesting facts for writers and everyone else. When including the Derby in your writing, there are a some things that really shouldn’t involve artistic license so I’ll save you the embarrassment with a few details that may help you with your work, and those of you who aren’t writers will have a tidbit of knowledge to impress your family and friends as you settle in front of the television on May 3rd to watch the 140th Kentucky Derby. The Kentucky Derby has been tagged as the “Greatest Two Minutes in Sports” because the journey begins before a horse is born, takes years of preparation to get to the race itself, and then the whole thing is over in about two minutes. Approximately 400 foals will be nominated each year, and no more than 20 of those will be allowed to compete in the Derby when they turn three. Entry eligibility is based on money earned. “Help me…” As an empath working for an organization dedicated to locating missing children, Liz MacKenzie is accustomed to using her unique abilities to sense the emotions of others. She’s not accustomed to hearing them call for her. That’s the specialized skill of a telepath. Galen Keifer’s special method of interrogation involves telepathic seduction, a technique that drove away the love of his life two years ago. In spite of their rocky past, Liz has reached out to him again. He’s the one man who may be able to discover the truth about the mysterious voice calling to her. 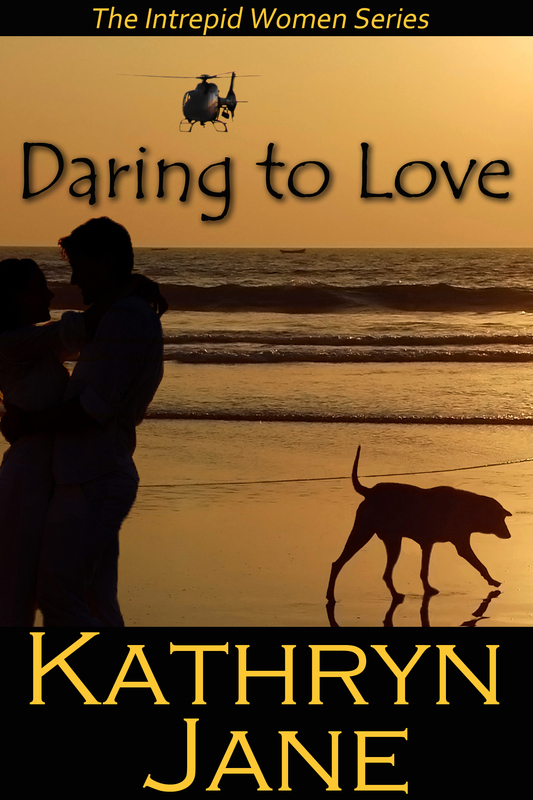 Stubborn, self-sufficient women, and the men who dare to love them.